Just before Christmas I wrote of how support for Labour and the Tories had reached an all-time low, with their combined share in opinion polls averaging around 64%. I added that I thought it highly unlikely any party will get near 35% of the vote at the election. Time has proved me wrong once again. Not only have both Labour and the Tories started hitting 35% fairly regularly, they’ve also begun exceeding it, sometimes hitting 36% and on one occasion 37%. 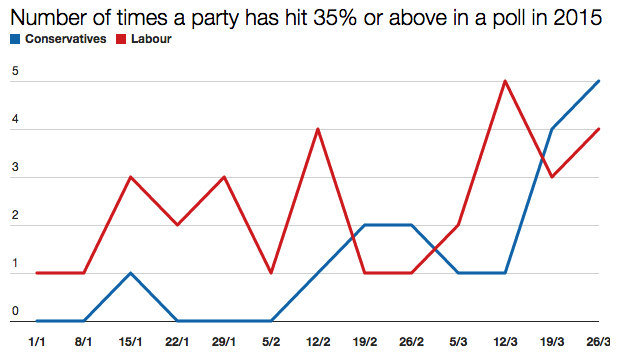 There’s not been one week since the beginning of 2015 when Labour hasn’t hit 35% or above. The Tories hit it once in the middle of January before falling back, but since the middle of February they’ve also been doing well. And in the last couple of weeks both parties have noticeably improved, with four or five instances of the 35% level being breached. Even more striking is that there have been four polls during the past fortnight which have put Labour and the Conservatives both either on or above 35% – in other words, a combined vote share of at least 70%. It’ll be fascinating to see if this trend continues right through to 7 May and marks something of a resurgence for two-party politics. Hmm. Has the number of polls each week been the same since 1 January? More or less: an average of around 12 a week. I am reasonably sure the combined LabCon share will remain around 70% but go no higher apart from the occasional outlier. Strangely Perhaps I am inclined to think it will decrease in GE2015 to 68% but this is higher than 66% in GE2010. Well this happened in 2010 (except on a much shorter timescale), with “Cleggmania” pretty much evaporating by the time polling day rolled round. In a first-past-the-post system, two-party hegemonies are really quite difficult to break up.